Michelin's Vision's “open-weave” architecture is solid in the centre and flexible on the outside and cannot blow out. 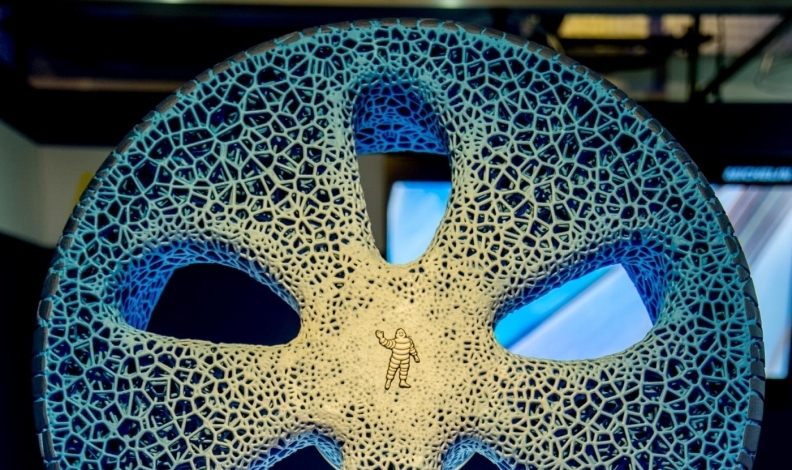 MONTREAL – Leading-edge technology meets ecological efficiency in Michelin’s newest airless tire concept, shown here June 14. Made of bio-sourced and biodegradable materials, it is created on a 3-D printer and with printable treads can be optimized for specific road- and weather conditions. The Vision’s “open-weave” architecture is solid in the centre and flexible on the outside and cannot blow out. A thinner tread uses less material, and can be reapplied with a printer when it wears or when driving conditions change, such as adding a winter-appropriate compound and tread. Still under development, the tire is equipped with sensors and provides real-time information about its condition; when necessary, it can schedule an appointment for re-treading through a mobile app. The company timed the debut with its Movin’ On event, previously known as the Bibendum Challenge. Now in its 13th iteration since 1998, this year’s event drew 3,000 participants from around the globe. Michelin President Jean-Dominique Senard said he chose the city when he met Montreal mayor Denis Coderre at a conference in Washington, D.C., who asked him to think about holding the program in Quebec. “Canada, Quebec, and Montreal are so involved in being ahead in sustainable mobility,” Senard said. “That issue is key in the future, because it is linked to a simple and natural collaboration of the public and private sector. “We need to bring innovation and foster new products, and the public sector helps through incentivizing these new technologies, or in creating regulations that help to develop and bring them to the market. “We are a tire company, but we are also incredibly specialized and knowledgeable in raw materials and their transformation,” Senard said. The Vision draws on the company’s airless Tweel tire introduced as a futuristic concept in 2005, which has found a market among golf carts, lawn mowers and skid-steer loaders. It's not the first time a company within the auto industry lauded Quebec for its dedication to a greener auto sector. Toyota launched Canadian sales of the 2017 plug-in electric hybrid Prius Prime in Quebec on June 1 because the province has accepted electric vehicles more than any other province.